New All-Ages Adventures with JOHNNY BOO and PIRATE PENGUIN! News | New All-Ages Adventures with JOHNNY BOO and PIRATE PENGUIN! Eisner Award winner James Kochalka is a master of many media, from comics to music to film and beyond... but one of his all-time most beloved projects is his series of graphic novels for kids starring the little ghost Johnny Boo, and his pet ghost Squiggle. In the new issue of Diamond Previews, we're delighted to unveil a brand-new adventure, Johnny Boo Goes Like This!, plus an awesome new boxed set of the series' first five books, Johnny Boo's Big Boo Box — both coming in March 2016! Johnny Boo and Squiggle come across a giant pencil! Is it... magical? Whatever it is, when Johnny Boo draws with it, his drawings come to life. Before you know it, they're off on another adventure, filled with tigers, ice cream monsters, and truly unbelievable hairstyles. 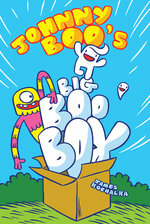 Celebrate the power of creativity - the Johnny Boo way! In stores March 2016 - click here for a 5-page preview! $39.99 (US) • Slipcase set of FIVE 40-page full-color hardcover graphic novels, 6” x 9” x 2"
Johnny Boo: The Best Little Ghost in the World to Johnny Boo Does Something! 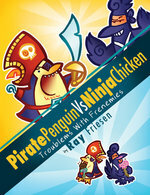 Ray Friesen's PIRATE PENGUIN VS NINJA CHICKEN is back, and funnier than ever before! Join the adventure in March! 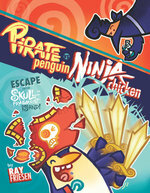 Pirate Penguin vs Ninja Chicken (Book 2): Escape from Skull-Fragment Island! Set phasers for maximum silly: Ray Friesen, the non-stop sugar rush called by Booklist “a manic blend of mayhem and adventure,” is back for more! When Pirate Penguin and Ninja Chicken stumble across a mystical lost sword, a rip-roaring aquatic adventure ensues, with appearances by cousin Privateer Puffin, the terrifying Pirate Queen, and two unforgettable "mermaids." PLUS: our heroes get trapped in a Swedish furniture store, and a dozen more wacky short stories! In stores March 2016 - click here for a 6-page preview! 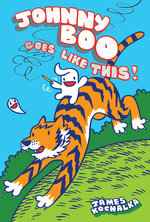 Johnny Boo (Book 7): Goes Like This!